When the OpenType font format was announced more than 12 years ago, one of its most promising features was a new level of intelligence built into the font. The idea was that the font could automatically substitute different glyphs (character shapes), depending on nearby characters. For example, an "a" at the beginning of a word could look quite different from one in middle of a word, or at the end of a word. The result is something that looks less "computerized" and more similar to the expert handiwork of typographers. Notice how the same letter looks different when it appears in different locations within a word. For example, the "s" in "Paul's" is different from the one in the next word. Note also the "d" and "s" in "descenders" are different from how they look in other words. The two "l"s in "technically" are also different from the "l"s in other words, such as "allow". (Have fun looking through the text for other examples—being a font geek isn't as embarrasing as it used to be. 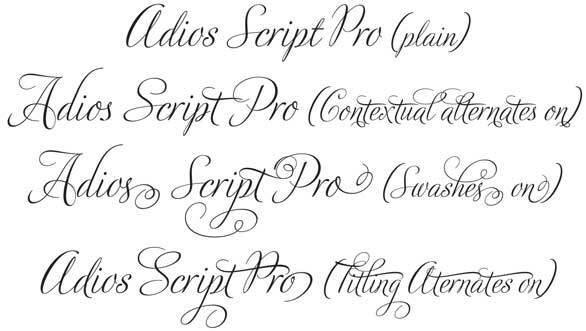 To see other amazing examples of Adios Script Pro in use, see Veer's Web site, where you can also buy this font for $99. 1. Font designers have to build the fonts, which requires expanding the way they think about their fonts. Over the years, a number of foundries have produced advanced OpenType fonts. Some excellent examples include P22's Cezanne, Typodermic's Domyouji, Linotype's Libelle and Zapfino Extra, and Adobe's Bickham Script. 2. Applications have to support the advanced features of OpenType. Some applications, such as the first versions of OS X page layout apps, may let you use advanced OpenType fonts, but they only provide access to the basic set of characters—the same ones available in TrueType or PostScript fonts. To make use of the advanced features, you'll need a recent version of tools such as Adobe InDesign ( ), QuarkXPress ( ), or even Apple's Pages ( ). 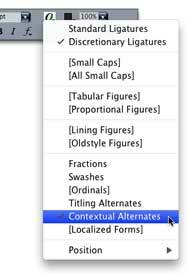 In QuarkXPress 7 and higher, the controls are in the Character Attributes tab of the Measurements palette. In Adobe InDesign, you'll find the controls buried several levels deep in the side (flyout) menu of the Character panel. In Pages, click the Fonts button in the Format bar, then choose Typography from the Actions menu at the bottom of the Fonts window. InDesign also makes use of Stylistic Sets, combinations of options that are available with one click. This makes it easier to quickly create pleasing typography. To apply OpenType options, you first select some text and then enable one or more options. That's important to remember, because you can apply separate combinations of options to individual characters, words, and so on. For example, you may want to add Swashes to some characters, Contextual Alternates to some words, and other options in other places. This lets you create a unique appearance for each block of text. If an option has brackets around its name, that means it's not included the OpenType font you're using. If you're not sure what Contextual Alternates, Swashes, and Titling Alternates are, check out some examples below. 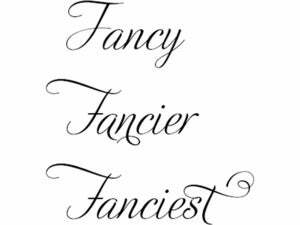 Options such as Contextual Alternates are most common in script fonts, where a random appearance adds to their artistry. But these advanced OpenType options are also available in some fonts intended for use in headlines and other display situations. 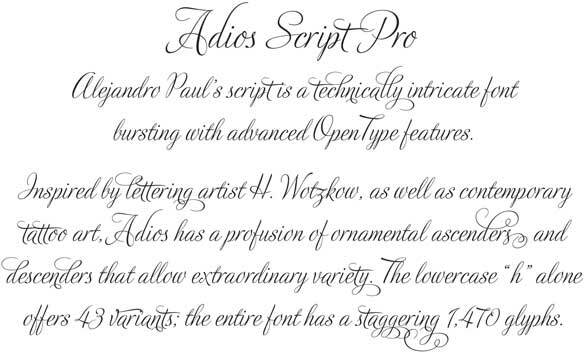 The next time you're called upon to create an invitation, announcement, logo, book cover, or other special document, an advanced OpenType font such as Adios Script Pro could make it truly unique.